Change. It is a word we are all familiar with. It is a condition we have all experienced in some way or another. It is something most of us resent or resist. Yet it is the one thing in life which is inevitable. Every single day, every single minute we are in a process of change. Seasons change, people change, climates change, political parties change, we are surrounded by change, it is interwoven into the very fabric of our lives. Most of it is so subtle, the effect of it is only visible ten years down the line, some of it is radical, sudden, catching us by surprise. Change is the one constant in Life. Whether we welcome change with open arms or try to resist it with all our being, every change comes with its joys and its regrets. We gain something and we lose something, it is like the ocean tide with its high and low tides. Change cannot be avoided, all we can alter is how we adapt to it and how we utilize it. 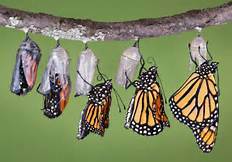 A quote from Richard Bach says it so well: "What the caterpillar calls the end of the world the Master calls the butterfly", it is all about point of view. Every encounter we have in life, every situation we find ourselves in brings about change in us, but also in those we pass by. Do we bring about positive change, or do I deposit seeds of destruction? Realizing that we are part of the process of the constant change taking place, helps us understand the responsibility that comes with it. We will most likely never know what change it is that we have helped create in others, we will never be able to press the "undo" button, therefore it is important that we tread carefully in the lives of others. Contemplating "change" makes me again realize how precious "now" is. "Now" is what we have, appreciate it, enjoy it, love it, LIVE it. It never comes this way again. That is why I am now going to post this and going to hug my husband who is here NOW!